After the massive controversy surrounding the first issue of Strange Fruit, I thought it time to read the issue myself and write something about it. I’ve been looking forward to the series since it was announced. 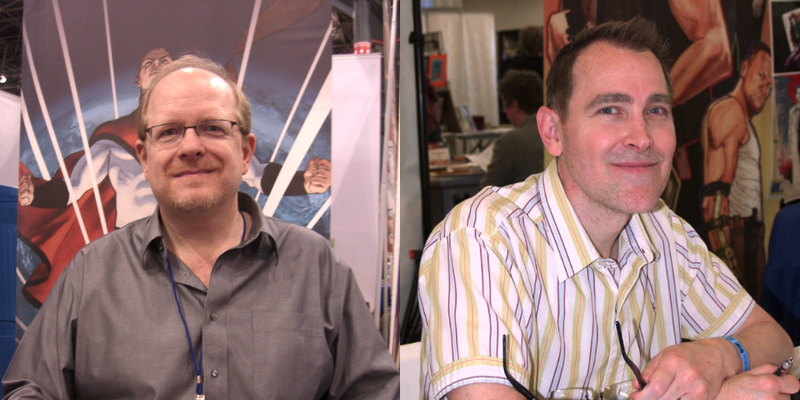 Mark Waid is one of my favourite current writers of comics, and the fact that J. G. Jones was on art duties was another plus. The fact that he was painting the entire thing was incredible too. I’ve only read two other comics by Jones, Wanted (2003-2005) by Mark Millar and Final Crisis (2008-2009) by Grant Morrison, and whilst the artwork inside both books is pencilled the covers were all painted. And the covers were the best pieces of art in both books. My first impression upon reading the comic is just how stellar the artwork is. I mean, it really is just absolutely incredible. It’s comparable to Alex Ross’ much acclaimed artwork on Kingdom Come (1996) and Marvels (1994), but with its own unique flavour. 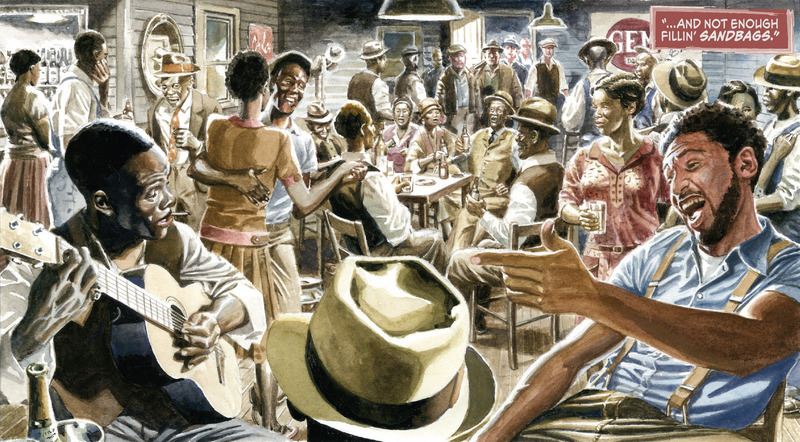 Furthermore, Jones heightens the intensity of the story with his highlights and beautiful, rich colours. The colours made me think of classic Technicolor films, like Gone With the Wind (1939). J. G. Jones’ use of colour in his beautiful paintings was reminiscent of classic Hollywood Technicolor films. The story itself is problematic, but I don’t think it deserves the huge controversy that it has received. 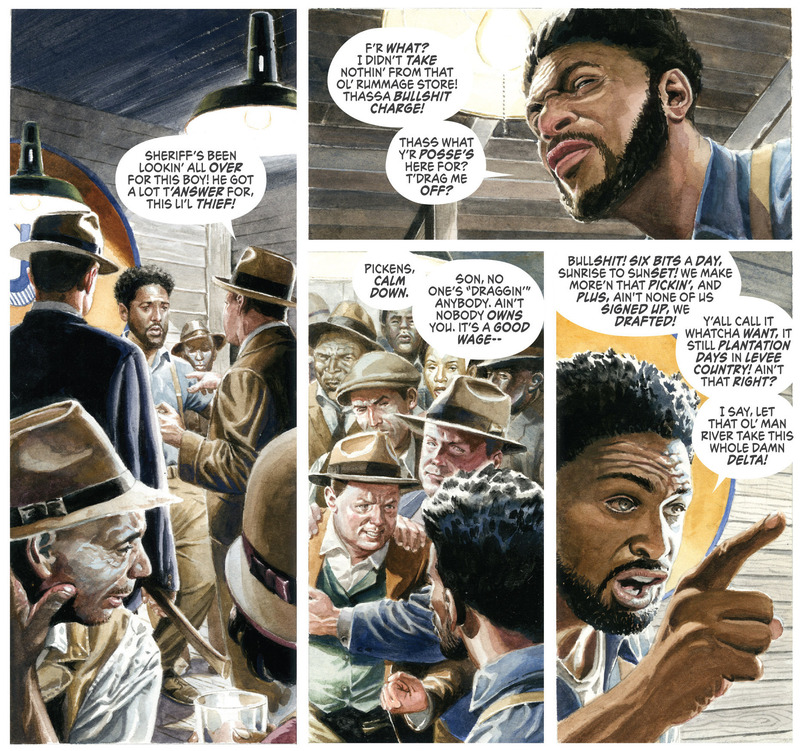 The concept of the book is basically re-imagining Superman as if he was black, and having crash-landed in the Mississippi delta in 1927, an era and place that was a hot-bed of racism and racial inequality. The writing itself is good, but as with perhaps most first issues, I feel that Waid is only just getting started. We meet a few characters, but none get too sketched out psychologically – there’s too much ground to cover in this first issue, and I think because of that the characterisation is lacking. I’m sure these characters will get richer and more complex as the next few issues come out, but at the moment it does feel a bit like you’re watching cardboard cut outs talking. This comic never should have been made. Not because there were missteps, not because Waid and Jones didn’t mean well, and not because white people should never write about black people at all. This comic should never have been made because there is too long a history of white people writing stories about racism and blackness, too long a history of white people shaping these tales to their own purposes, too long a history of white people writing about what they genuinely cannot understand. And above all, too long a history of white people, particularly men, being able to do this. 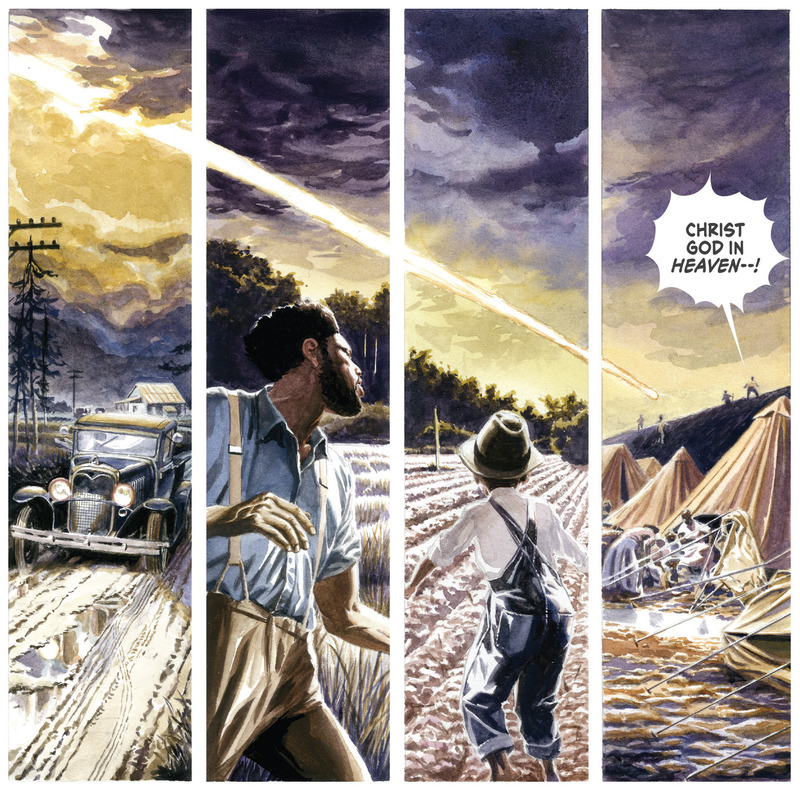 Mark Waid and J. G. Jones have crafted a troubling but compelling read. First off, I have a problem with anybody saying that certain stories should not be written by certain people. That just seems a bit inane to me. I do however have to say, despite my love for Mark Waid’s writing, that Micheline does have point about Waid and Jones’ approach to the material. Waid and Jones do seem to only be able to understand the racism of the era through racial violence and the Ku Klux Klan. That’s a bit problematic for me because it’s a massive oversimplification of the problems of the era. The racism extended way beyond the violence depicted in the book. 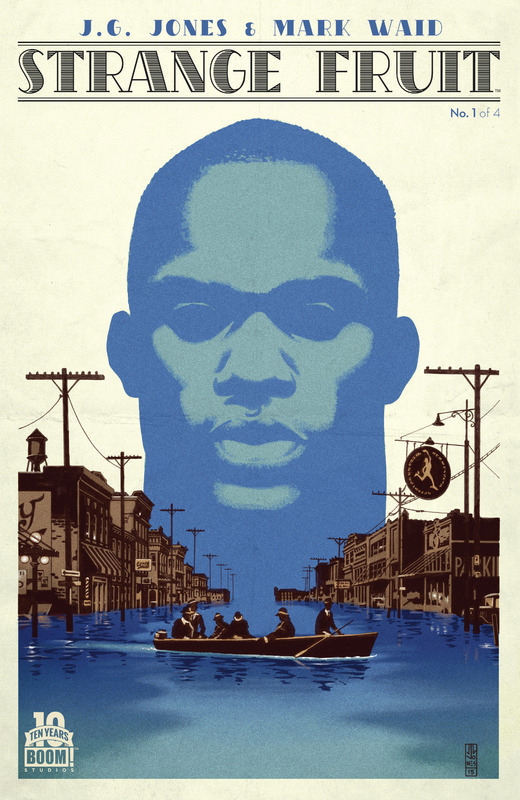 Waid does show hints of that, but sparingly; racism in Strange Fruit is driven by violence. It does give the impression that outside of violence, life for African Americans people in Mississippi is not too bad. Sure, they live in poverty, but other than the occasional violence of white people life is ok. This is hugely problematic. What really happened is that, despite the emancipation of slaves in America in 1865, the racists of the South sought to effectively continue the enslavement of African Americans. This meant hiring them at plantations and elsewhere for manual labour, but paying them at such a low rate that there is no social mobility. For all intents and purposes, it was slavery. This system was called sharecropping, and essentially black farmers would be able to work on plantation land, and have their own land rented on it, in exchange for giving up some of the crops they made. Strange Fruit only occasionally deals with the racism of the era outside of the violence. The first issue of Strange Fruit isn’t conscious of this. It’s a big concern, especially when you’re writing a story so focused and conscious of racial inequality. Whereas the art captures the era, the writing leaves something to be desired. My final issue with the book is the ending of issue 1. Our black hero, the nameless Superman of the book, finally appears. He’s stark naked, massively muscled and huge, and set against a sky filled with lightning. There is no sense of goodness about him, only a primal threat. It’s reminiscent of Frankenstein’s monster in many ways. He then proceeds to disband and defeat a few KKK members who are trying to lynch Sonny, another significant black character in the book. He’s entirely naked whilst doing so, only covering up his appendage with a confederate flag. I liked this part of the ending, if only because here was a supposed black hero reclaiming his southern origins and making it his own and re-empowering the trodden upon. But the fact that the hero is so muscled and naked is a massive problem. 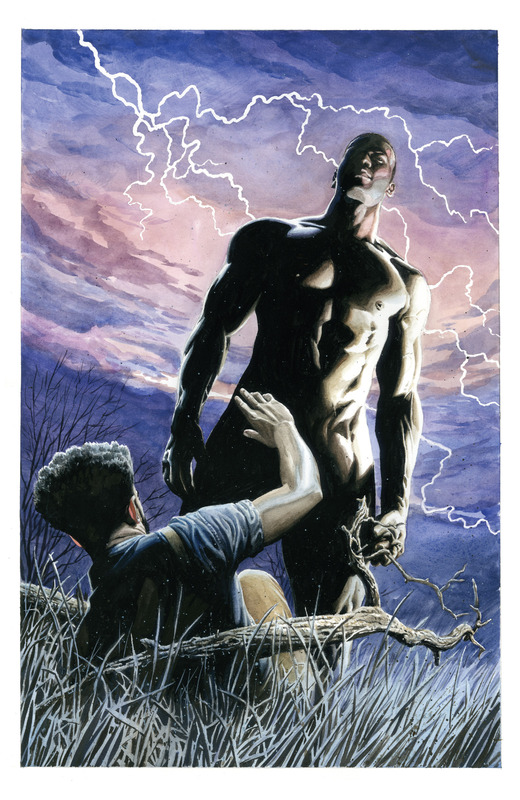 The history of whites speaking about a “sexual primal threat” from black men makes the first, Frankenstein-like appearance of Strange Fruit’s hero problematic. Basically, there is a history of whites sexualising the black body – in essence making the black man something of a sexual threat to the innocent white women of the South. We can see this in terms such as Mandingos. Basically, it rids the characters of any sense of character or self and replaces it with a primal, sexual threat. Think savages running around naked in the jungle and that’s basically the problem here. The hero of the book is nothing but sexual threat when he first appears. I question if he really had to be naked. Sure, Superman was naked when he first arrived, but that’s not problematic considering there isn’t a history of racism against whites. Here it is, and having this cobbled together with the depiction of racism in the South leaves a troubling book. I personally think these problems are unintentional. I don’t think Waid or Jones are racists. But I think having a black man or woman being part of the creative team would have stopped these problems from obscuring the generally interesting story that Waid and Jones have crafted. The artwork is stellar too. I just hope in future issues the problematic representation of the era can be dealt with. Waid is an intelligent and thought-provoking writer, so I think that’s entirely possible.